I’ve been researching different types of sweeteners, in particular, those which are more natural and less processed. Of course, any type of sweetener which is purchased in a bag or bottle has been through some kind of processing. 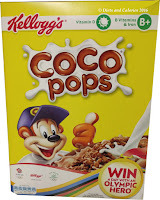 However, there are some which are being touted as a more natural and healthier alternative to regular sugar. One of these is erythritol. This is a zero calorie sugar replacement which doesn’t produce the same type of blood sugar increase as regular table sugar. I’ve managed to reduce my sweet tooth over the years but still need to sweeten my tea and coffee a small amount to enjoy it. However, I don’t want the negative effects of sugar such as the excess empty calories in my diet, or the tooth decaying properties. I’d also prefer to avoid artificial sweeteners which may or may not have links to cancer. I like Truvia a lot. This is a mixture of stevia (steviol glycosides and erythritol). The erythritol is used as a bulking agent and to counteract the intense sweetness of stevia. It’s also what makes it look and feel like sugar. Erythritol is a polyol, or sugar alcohol which can be found naturally occurring in fruit such as pears, grapes and melons. 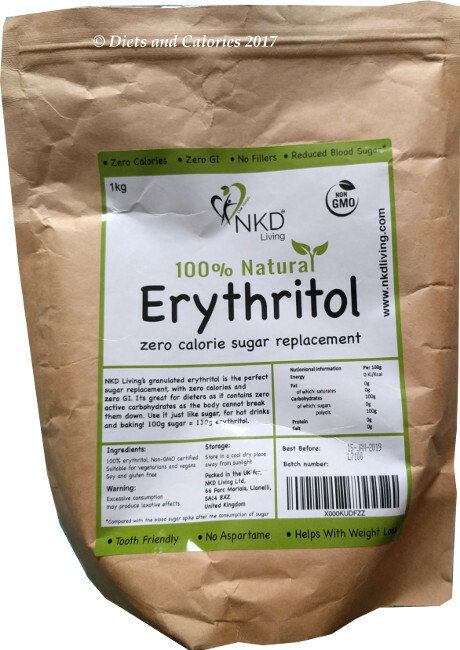 I purchased a pack of Erythritol from NKD Living via Amazon (100% Natural Erythritol 1 Kg | ZERO Calorie Sugar Replacement ). There are other brands as well, but I like the NKD brand. This particular bag contains 1kg and cost £9.20 on Amazon. That may seem like a lot, but it's lasted me just under 3 months using it as a sweetener in my teas and coffees every day. 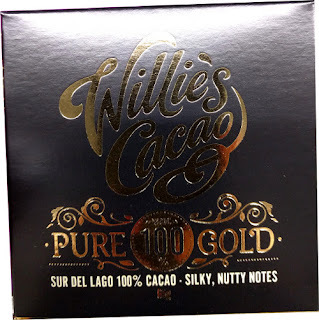 It comes in a resealable bag and this pack has a best before date of January 2019 – so a long shelf life. 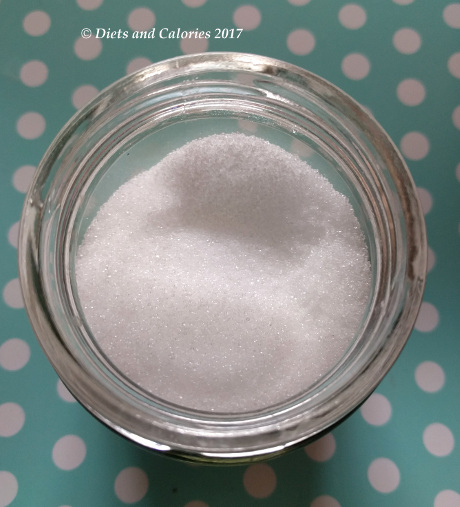 This erythritol appears identical to white granulated sugar. You really couldn’t tell the difference just by looking at it. It doesn’t smell at all sweet but its texture is virtually identical to sugar. It has the same crunch and sprinkles the same way. What about taste? I tested a small amount on its own. It dissolves in a similar way to sugar but I found it hard to detect much sweetness. This was put to the test in my first cup of tea. I put in one teaspoon and it barely registered. In fact, I had to use around 3 times the amount of erythritol compared to regular sweetener to achieve the same, or close to the same level of sweetness. My children weren't fooled and detected instantly that this was not their usual sweetener. They then refused to touch it! Personally, I couldn’t face spooning that quantity of erythritol into each cup of tea, so I’ve been mixing it with another stevia product I have. Basically I’ve made my own Truvia! It's also probably not a good idea to be using large quantities of erythritol since it can have laxative effects when used excessively. How much is excessive is all down to individual tolerance. But I'd say if you were having 5 or 6 cups of tea a day with three teaspoons of erythritol in each drink, that would be classed as a lot. I probably won’t be buying this again as I prefer the convenience of Truvia. 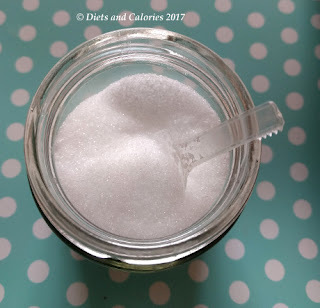 However, I have found it useful in helping me retrain my taste buds to accepting reduced sweetness in my drinks and I now use less sweetener overall. If you’re concerned about tooth health, it seems that erythritol doesn’t have the beneficial plaque reducing effects that xylitol has. See study. However, it does state on the pack that it's tooth friendly. It could be helpful for those with diabetes as it doesn't raise glucose levels in the same was as sugar, and may help with weight loss due its lack of calories. Ingredients: 100% erythritol, non-GMO certified. Suitable for vegetarians and vegans. Soy and gluten free. 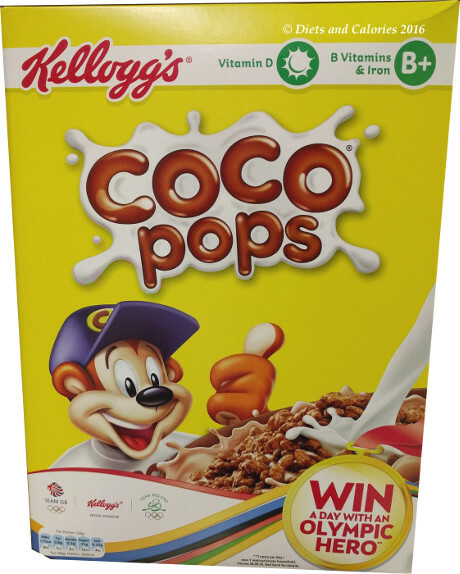 Nutrition information per 100g: 0 calories, 0g fat, 0g saturated fat, 100g carbohydrates, 0g sugars, Polyols 100g, 0g protein, 0g salt.